This map shows Adams Morgan, a popular neighborhood in NW Washington, DC. The main corridor of activity in Adams Morgan is along Columbia Road and 18th Street NW. The neighborhood is bound by Florida Avenue to the south; 19th Street and Columbia Road to the west; Adams Mill Road and Harvard Street to the north; and 16th Street to the east. When visiting the Adams Morgan neighborhood of Washington DC, the streets are narrow and parking is very limited so it is a good idea to take public transportation. Adams Morgan is one of DC’s liveliest nightlife hot spots and is especially busy on Thursday, Friday and Saturday evenings. The neighborhood is home to many sidewalk cafes, ethnic restaurants, intimate coffee shops, and some of the most popular bars in the nation’s capital. During the day, on-street metered parking is available. Many streets in the area have multi-space parking meters, where you can pay with cash or a credit card and then print a receipt to place on the dashboard. 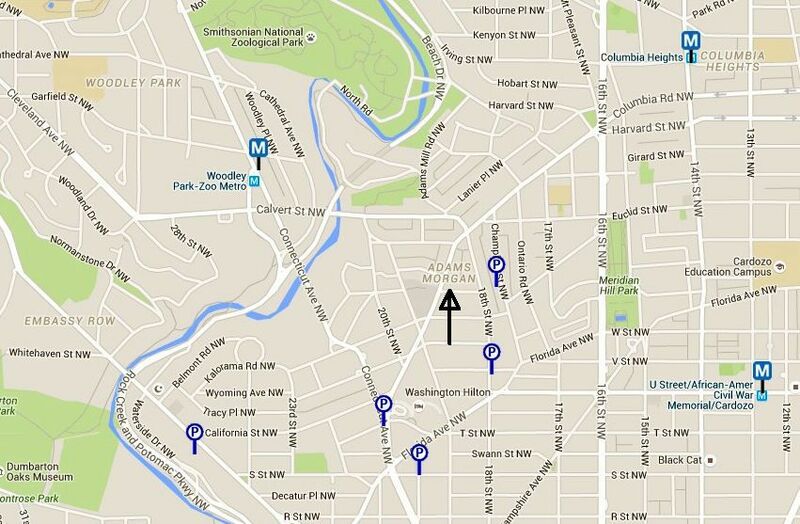 Although the closest Metro Station is named Woodley Park-Zoo/Adams Morgan, it is not located right in Adams Morgan. It is actually about a 15-minute walk to get to the heart of the neighborhood. To walk from the station, head south on Connecticut Avenue and turn left on Calvert Street, proceed over the Duke Ellington Bridge, continue along Calvert until you reach the intersection of Columbia Road and 18th Street. For general Metro information, see a guide to using the Washington Metrorail. To avoid walking from the metro station, you can transfer to the DC Circulator Bus which runs on Sunday – Thursday from 7 a.m. – Midnight and Friday and Saturday from 7 a.m. - 3:30 a.m. Adams Morgan is also about a 15-minute walk from the Columbia Heights and the Dupont Circle Stations. Driving to Adams Morgan requires navigating through traffic along many smaller streets. The neighborhood is located near the center of the city and is not close to any interstate highways. It is located north of Dupont Circle, east of Kalorama, south of Mt. Pleasant, and west of Columbia Heights. Colonial Parking - Two locations, 2328 Champlain St Washington, DC and - 2328 Champlain St Washington, DC. The locally based company operates more than 200 parking lots serving office buildings, retail malls, hotels, sporting events, and hospitals. The Park at Adams Morgan - 1711 Florida Ave NW. Washington, DC. This parking lot is conveniently located and offers hourly, daily, evening and overnight rates. 230 spaces. Universal Garage - 1825 Connecticut Ave NW (Intersection of T Street NW) Washington, DC. The parking garage is located at the FHI 260 Conference Center. Laz Parking Mid-Atlantic - 2001 S St NW Washington, DC. LAZ has parking garages across the U.S.
Lauriol Plaza - 2009 18th Street, NW (Intersection of 18th and California Sts.) Washington DC. The Mexican restaurant has a large parking lot two blocks from its entrance and offers free parking to its customers. Adams Morgan is a special neighborhood, a fun place to spend an evening and people watch. With its ethnic diversity, varied colors and architecture, and a wide range of great restaurants and nightclubs, no wonder it’s a popular destination.